I wonder what rock climbing shoes he is wearing? La Sportiva Solutions maybe? Thinking of purchasing your first pair of rock climbing shoes or even thinking of upgrading from a beginner’s pair to master the climbing walls with? Or, if you are just browsing online for some helpful information on rock climbing shoes and what to consider when purchasing, well, we put together a simple comparison chart of the top 10 best rock climbing shoes. Most people think that your hands are the most important tool that you use when climbing. This is true but your shoes are just as important. The shoe in the interface between you and the rock so you really need to make sure that you choose the best shoes based on the type of climbing you are doing. Before we begin with the rock climbing shoe review and comparison I did want to bring up 2 EXCELLENT rock climbing training resources that we came across. The first one is called the The Rock Climber’s Training Manual written by Michael L. Anderson PhD. Don is an outdoorsmen who is always sharing helpful tips and tricks. Here is his YouTube page to see all of his videos. The second great rock climbing resource I’d like to share before we begin with the reviews is one by Dan M. Hague called Self-Coached Climber: The Guide to Movement, Training, Performance. Mick has been climbing for 43 years and is a physiologist who has helped many people improve their performance and potential. He provide some great advice and shares his formula for success when it comes to reaching those higher grades. Beginner climbers should choose a more versatile pair of shoes more for all-around climbing for optimal comfort. As a beginner, you don’t want to start off by spending $100’s of dollars on advanced level shoes because you haven’t experienced climbing just yet and you can end up in more pain then you realize. Advanced climbers may want to invest in multiple pairs of shoes because they may have developed several types of climbing abilities and objectives. Rotating your shoes as you go on different climbs is a good technique because it will prevent hot spots that can come about when wearing the same pair of shoes. There are several types of shoe categories to be aware of and characteristics that belong to each. The uppers tend to either be synthetic or leather. Synthetic shoes tend to be a favorite among vegans (hence no leather) and are mostly performance shoes. The leather is also a popular choice since it’s the easiest to care for. Leather shoes, whether lined or unlined, can stretch but lined leather shoes tend to reduce the stretch to a half size or less. With unlined leather, you want to make sure you size them so your toes just touch the end of the shoe. Synthetic shoes do not stretch nearly as much as leather. After a while of use, the synthetic part of the shoe will soften up. If you looking for synthetic that does not soften up too much over time then you may want to look into perforated synthetic. You may also hear the term last thrown around a lot when looking up climbing shoes. A last is simply the model around where the shoe is built and is foot-shaped. All of the heel/toe dimensions and instep volume/height are all given by the last. The shoes mentioned in this review have a weight between 7 oz and 9.3 oz, which give you a good range to compare from. Of course, the woman and men shoes are both included in that range so make sure you look at the correct shoe gender type. Weight can definitely be a big factor for climbers of all skill levels but today with the modem material and technology they all are around the same weight. It’s never too early for your little one to start climbing. You can easily rent shoes at most facilities but it may be best to grab a pair yourself especially if they seem to really enjoy the sport. I’d recommend buying a size larger because kids feet do grow fast and kids like the fit to be a bit looser then adults. 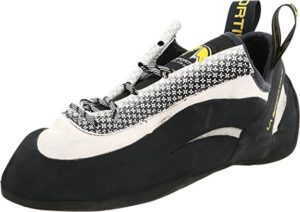 With an asymmetric shape for advanced performance the LaSportiva Tarantulance is a great unlined leather climbing shoe. You can wear this shoe all-day and still get great performance out of this shoe because of the RN45 last which is a nice extra bonus feature. The plush leather is soft and super comfortable and the synthetic leather overlay, which includes a lacing harness, add superb support for both beginners and mid-level climbers. Worried if you can stand in micro-edges? Well, with the aggressive rubber heel rand you can dominate those micro-edges because of the hard wearing FriXion RS rubber. The Tranantulance rubber has a pretty good stickiness to it as well and will last a long time. Compared to the Evolv shoes above this is also a beginner to intermediate shoe however it does have a slightly thicker rubber and slightly more aggressive toe and heel for those who are looking to get into those micro edges. Also to note, there are less complaints of odor after wearing these shoes so that could lead to better overall ventilation. These shoes, as you can tell, are lace shoes rather then Velcro so if that is more to your preference then these are the shoes for you. La Sportiva North America is a combination of hikers, bikers, trail runners, skiers, climbers and outdoor enthusiast who take pride in their products and always strive to provide the very best outdoor footwear possible. Quick pull lacing harness, Unlined leather upper with synthetic overlay for a good balance of comfort and support, Lined tongue for comfort and moisture management, semi-aggressive heel/toe, Nice heel and toe for hooking. Quick pull lacing harness, Unlined leather upper with synthetic overlay for a good balance of comfort and support, Lined tongue for comfort and moisture management, semi-aggressive heel/toe, Nice heel and toe for hooking. Nice heel and toe for hooking, narrower shoe fit. 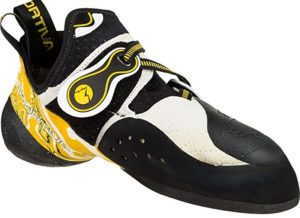 Another great shoe provided by La Sportiva, the Nago is an excellent beginner to intermediate climbing shoe. The shoe does feel like a higher end performance climbing shoe while keeping the cost just under $100USD. The Nago has a slight arch in the heel and is a bit narrow to complement most women’s feet. The lacing is a nice touch as well because you can control the tightness and secureness of the shoe to your liking. Even though these are made for woman, men can also wear these, as they are a good choice for either with low-volume feet. 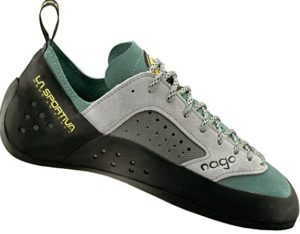 The Nago is a lower shoe so if you are climbing in colder weather you may want to look for a higher shoe that covers a bit more of your ankle/foot but these are also still wearable if you have a higher sock. For those climbers who have issues in the vertical part of the toe box these tend to have more room then others we’ve compared so you won’t have to worry too much about your toenails hitting the top of the inside of the shoe. Ventilated upper, large vertical toe box area, pointy tip good for incuts. some complain about the shoe cutting into heel. Evolv has done a great job with climbing shoes and to prove that the Defy Vtr is the top selling men’s climbing shoe in the USA. 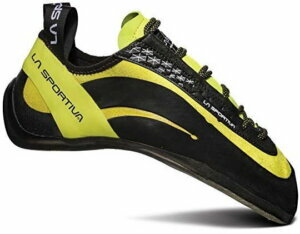 A great beginners shoe with high quality performance climbing in mind at an affordable price you can’t go wrong. The Defy Vtr has a plush bedroom slipper feel and is comfortable enough you can even wear these for longer periods of time. Assembled in the USA, Evolv is proud to sponsor world-class athletes. The Defy Vtr can be used for indoor and outdoor rock climbing, bouldering or sport climbing. 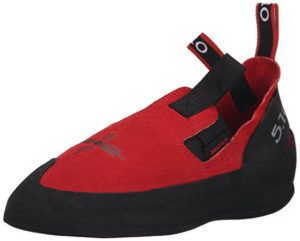 Be sure to view the sizing chart when ordering but even though these are synthetic shoes which tend to not stretch users have mentioned that they do fit better after a day or two of climbing. The Defy Vtr provides great fit, great comfort and sensitivity to climbers of all levels. Great price, comfortable, can fit women as well, great beginner climbing shoe, good for both indoor and outdoor climbing, strong velcro. Bad Heal (not good for hooking), Poor ventalation (can get smelly fast so use dryer sheet and air them), soft rubber but manageable, not an agressive toe, not good for sticking to tiny holes. The TRAX rubber on the Defy Vtr tends to hold up pretty well from the customer reviews and the strong Velcro makes it feel more like a solid fit. Make sure you air them out regularly after use, as they tend to need that extra ventilation. Also, you may want to go with a size a bit tighter then usual as they tend to stretch a bit after use. 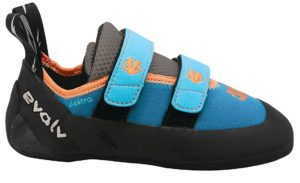 strong velcro, great beginner climbing shoe, good for both indoor and outdoor climbing. Bad Heal (not good for hooking), Poor ventalation (can get smelly fast so use dryer sheet and air them), not an agressive toe, not good for sticking to tiny holes. 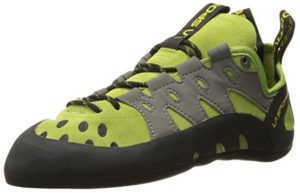 The woman’s Katana shoe is great for all around terrain and climbing. It features a breathable tongue to constantly keep your feet cool in hot weather. There are opposing Velcro wraps, which means the two Velcro wraps close in the opposite direction to provide the best overall fit and comfort. The Katana is build on the very successful Miura climbing shoe last so it’s clear to see why the Katana will be able to last for years on the walls. The Katana has a bit of an aggressive toe but at the same time can handle “casual ” climbs with ease. There is synthetic fiber lining and synthetic in the back for the best moisture management. The toe box is made from synthetic leather that is made with micro-fibers for a water-repellant, high durable and breathable material. The slingshot rand will help you drive your foot forward. The rand is also all around the shoe, which will prevent it from stretching. The Miura climbing shoe line has been very successful. These Miura Lace climbing shoes are a bit more expensive than most but they are worth it. The quality is superb as well as the comfort and design. 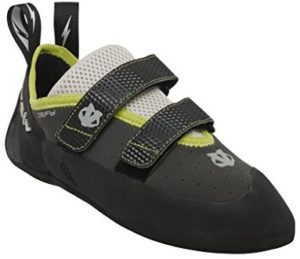 The toe has an aggressive (but not too aggressive) tip for those climbers who need a climbing shoe that isn’t so flat. This shoe you can hook an edge with ease without having to worry. The edge rubber is firmer but the toe is a bit softer which is a nice touch. The double heel hoops give you more than one way to get the shoe on without having to wear down just one hoop. This is a lined shoe and it’s doesn’t tend to stretch like some so the size holds true throughout the life of the shoe. The laces on this shoe are stronger than most and also has a speed lacing design so you can get them on and laced up in no time. The Miura Lace shoes here is a bit more on the expensive side but you get what you pay for which is a quality, high performance shoe you won’t be disappointed with. The Miura Woman’s climbing shoe (not to be confused with the Miura VS Woman’s climbing shoe) has been a top seller in the US for some time. The VS model is also a great shoe but the non-VS has gotten more time in the market and has still been a favorite. 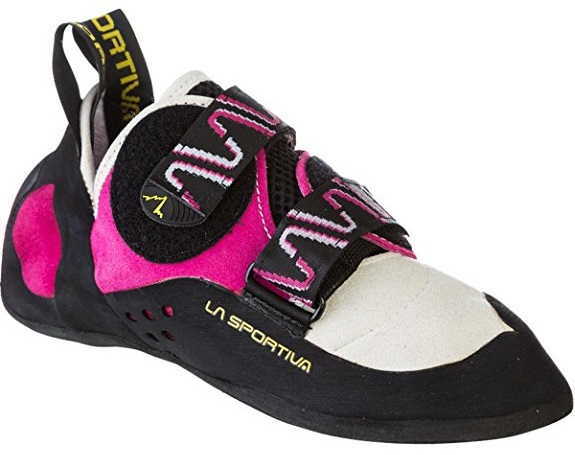 This is a laced climbing shoe but is has speed lacing which can cut your lacing time in half compared to a normal non-speed lacing climbers shoe. It has an aggressive toe and heel to get into those tiny cracks. It has a high tension slingshot rand which covers the entire shoe and when small edges are weighed the shoe will stretched in the back half of the shoe as opposed to the front. Some say the Miura climbing shoe isn’t for beginners because of the price and mainly the aggressiveness so it may be more of a shoe you would choose if you are moving away from a beginners climbing shoe. As with most new climbing shoes, you may feel some discomfort as you break them in but overtime they will adjust to your feet. Some climbers don’t even notice this process and can climb with no issues while the shoe is broken in. For a beginner to intermediate climber these shoes are a great choice because of all the extras it has while still keeping the price reasonable. This climbing shoe has triple heel tabs, which will make it much easier to slip on the shoe from different angles. This shoe is a slippers design so no laces or Velcro that usually means you may need to go with a smaller size since all you have is the slipper approach and no additional way to tighten the shoe. These are also resole-able if you wanted to replace the sole due to wear and tear. The heel is a slingshot design, which wraps around the entire shoe for extra support and climbing. They are comfortable enough for long climbs due to the leather surrounding and minimal stretching. So now that you’ve read this review and seen the top 10 best rock climbing shoes which one are you going to pick? It all really comes down to what type of climbing you will be doing as well as budget and skill level. Make the best choice for you given the information above. Happy climbing!